The opposition offered by any conductor for the flow of current is called resistance. Its unit is ohm and denoted by Ω. When an electric field is applied to any conductor the electrons start to move in a specific direction. However, they continue colliding with neighboring atoms and ions. These continued collision slow down the motion of electrons consequently, the current gets lowered. 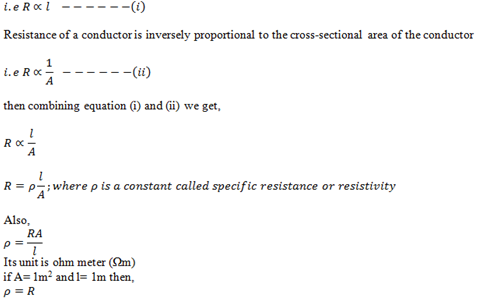 So, the cause of resistance in any conductor is the no. of collision of electrons with neighboring atoms and ions. Resistance of any conductor depends on dimension (length and breadth) and temperature. Resistance of a conductor is directly proportional to the length of conductor. Thus, resistivity of a conductor is the resistance of the conductor of unit cross-section area and unit length. Resistivity is dependent of the dimension of the conductor. It depends on the nature of the material. So, it is the characteristics of any material. 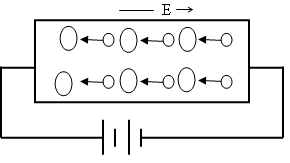 The reciprocal of resistance is called conductance. Its unit is /ohm or siemen. The reciprocal of resistivity is called conductivity. Its unit is /ohm m.